Bay Window approx. size: w5'x h4'4"
Port Hole approx. size: w12"x h12"
Ship in a Bottle approx. size: w12"x h11"
Imagine the waves crashing along the shore. 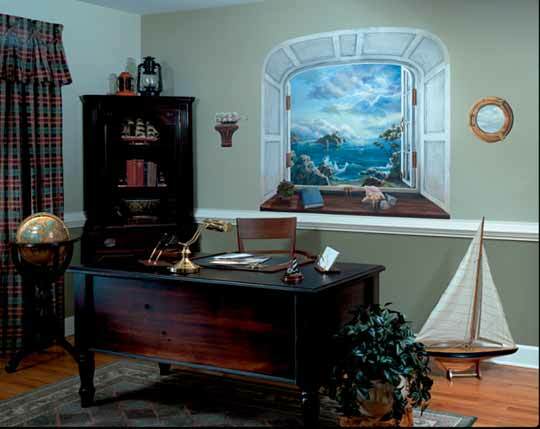 Set a nautical theme with this mural of a rugged coastline and distant lighthouse with sailboats gliding by. The trompe l'oeil (deceive the eye) window is framed by antique crackle finished architectural details. 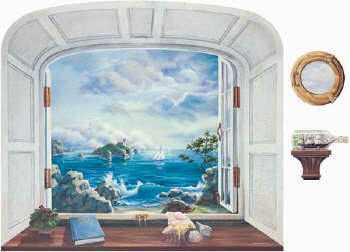 Included with the main mural is a brass porthole and the classic ship-in-a-bottle. These mural pieces will look great in a masculine office, as a headboard for a bed or anywhere you need the calming effect of the ocean. An illustrated Creative Idea sheet which is included with each mural will give you additional ideas for decorating with a nautical theme.